The Breton legends tell that at the foot of each rainbow appears a cauldron filled with gold and that each tribe of Korrigans rivals tricks to seize it first. Search for the legendary gold cauldron with your facetious Korrigans tribe. Across the fields, gather four-leaf clovers, collect gold coins and lure companions to help you on your adventure. The rainbow will tell you where to find the fabulous treasure. 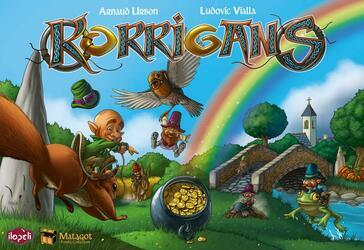 Korrigans is a fun game with clever rules for the whole family, from 2 to 5 players.